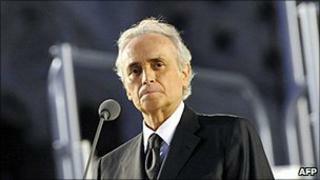 Tenor Jose Carreras is to perform at Milan's La Scala for the first time in 14 years at a benefit concert. The Three Tenors star will sing at an event to raise funds for cancer research at the Italian opera house on 10 October. Carreras has said that "every singer has a special love for La Scala". The Spaniard spent almost a year in hospital and underwent a bone marrow transplant in 1997 after being diagnosed with leukaemia. His Three Tenors co-star Placido Domingo recently had surgery for colon cancer, while Luciano Pavarotti died in September 2007 from pancreatic cancer. The concert will take place during the European Society for Medical Oncology's congress in the Italian city, which will be attended by 15,000 cancer experts from around the world. Details of Carreras's repertoire for the event have yet to be announced. The 63-year-old's last appearance at La Scala in 1996 was in the opera Fedora by composer Umberto Giordani. In May, Carreras's manager denied reports that he would retire from operatic stage roles, but said the singer would focus on concerts and tours. A year after his battle with cancer, Carreras established a foundation in his name to raise funds for research into leukaemia. It has established a bone marrow donor database for Spain and recently embarked on the creation of a dedicated research centre near Carreras's home city of Barcelona.